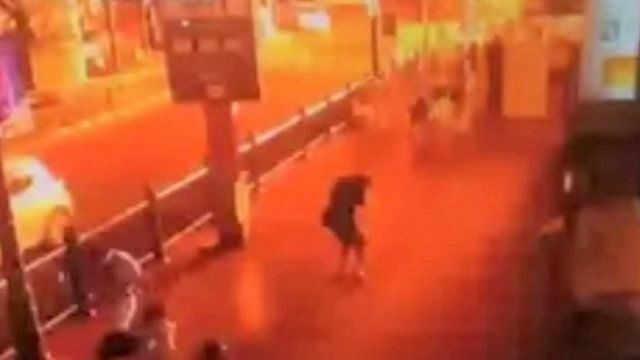 Moment of Bangkok explosion Jump to media player Footage shows the moment of an explosion close to a shrine in the centre of the Thai capital, Bangkok. Bomb blast at central Bangkok shrine Jump to media player A large explosion close to a shrine in the centre of the Thai capital, Bangkok, was caused by a bomb, according to police. Bangkok blast: 'Acrid smell in the air' Jump to media player Barry Newhouse, editor-in chief of the Voice of America, describes the aftermath of an explosion Bangkok, telling the BBC, 'there was a real acrid smell in the air". 'I saw lots and lots of dead bodies' Jump to media player The BBC's James Sales describes administering CPR to an injured man in the aftermath of an explosion close to a shrine in the centre of Thailand's capital, Bangkok. A bomb has exploded close to a shrine in the centre of the Thai capital, Bangkok. At least 19 people have died and at least 100 more have been injured. CCTV footage showed the moment the blast happened.